Quick: what’s the most-awarded Chevy of the year? Here’s a hint. It’s the 2017 Motor Trend Car of the Year. The The AutoGuide.com Readers’ Choice Green Car of the Year. One of Automobile Magazine’s 2017 All-Stars. Give up? It’s the Chevy Bolt EV, but the accolades don’t stop there. It’s also the 2017 Green Car of the Year, according to Green Car Journal. The “Best Car to Buy in 2017,” according to Green Car Reports. A 2017 North American Car of the Year, and one of Car and Driver’s “10Best” for the 2017 model year. Heck, the Bolt was even one of the 25 Best Inventions of 2016, according to Time Magazine. With press like that, perhaps the Bolt has been on your mind. One of the biggest things holding back the widespread adoption of electric vehicles is “range anxiety.” That is, many buyers are wary of electric vehicles because they’re unsure if a full vehicle charge will be able to last for the duration of their daily driving activity. That hesitation is especially relevant today, as many public parking spaces and garages don’t have charging spots to power up a vehicle while its driver is at work, at the mall, etc. The Bolt looks to put an end to worries about electric range. Specifically, it’s able to drive up to 383 kilometers on a single charge—meaning you could go from Oakville to Windsor and still have charge to spare. That’s significant, especially when you consider that the average person’s daily commute is only about 65 km. Oh, and if you’re ever caught in a bind, the Bolt offers a fast charging feature where just 30 minutes of charge times can get you about 145 km. Of all the electric cars that are currently on the market, no vehicle can top the Bolt when it comes to range. This kind of range means the Bolt achieves a fuel economy of 2 liters/100 km in combined highway/city driving conditions. But energy can be conserved with a couple of notable features. The first is “Regen on Demand,” which lets you use the steering wheel paddle to brake in such a way that energy is transferred back to the battery. The other notable energy-conserver is the Bolt’s one-pedal driving feature, where you simply lift your foot off the accelerator to come to a stop, rather than using the brake and expending more energy. 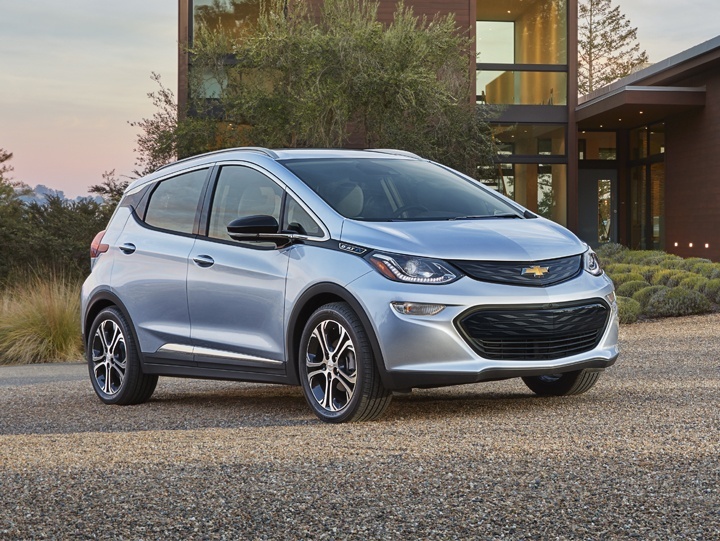 Aside from the groundbreaking electric range and charging capability, the Bolt also offers a lot more to drivers. From the exterior, its crossover-like design with a hatchback trunk is a real head-turner. It comfortably seats five passengers, but the rear seats are easy to fold down for additional cargo space. In the driver’s seat, a touch screen interface and driver screen can help provide you with information ranging from the radio station you have on to how much energy you’re using. The Bolt comes equipped with 10 air bags and is constructed on a high-strength steel frame to help keep occupants safe. It also comes standard with a rear camera and a surround vision safety system that takes a 360-degree look at the vehicle’s surroundings to help keep occupants safe. Is it time for a 2017 Chevy Bolt EV? Did you know that you can get up to $14,000 from the Ministry of Transportation when you buy or lease a 2017 Bolt? If that doesn’t get you moving, nothing will. Car of the year, and thousands of dollars in incentives—if that sounds like a deal, we’d be happy to help you fall in love with all the 2017 Chevy Bolt EV has to offer.